Description Mute traces using a header value or constant. Simple mute zeroes each trace using a header value or constant, with an optional moveout applied to the mute. 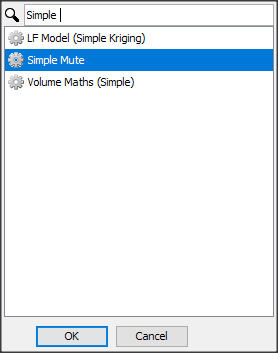 Search and double-click Simple Mute. Volume: Select the volume to mute. Mode: Select Taper Mode to specify ramp centred on the mute or Threshold Mode to specify threshold amplitude. Mute value: Derive the mute from a header value or use a constant. Ramp: Apply a ramp to the muting, centred at the mute. 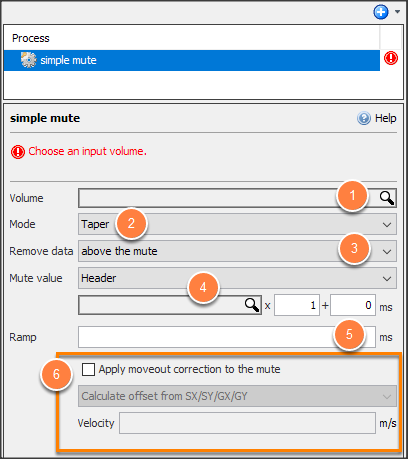 Apply moveout correction to the mute: If checked, shift the mute time according to the calculated moveout (from offset and velocity). Only applicable to time volumes. Use offset distance values from the OFFSET header, or calculate from the source and receiver location. Velocity: Enter the velocity for calculating the moveout.